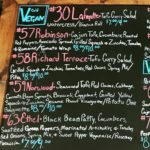 About: This neighborhood favorite offers local, fresh, environmentally friendly food – including vegan options. Cherry Deli is located in East Hills just enough away from the hustle and bustle of the other restaurants and shops on Cherry Street. That’s a good thing because you can almost always find parking right outside the building. If you’ve been to Two Beards Deli, you’re gonna feel a bit of déjà vu as they have the same owner and the same style of massive menus with almost endless combinations. There are hundreds of items on the menu, but lucky for us, they have them broken down by type. 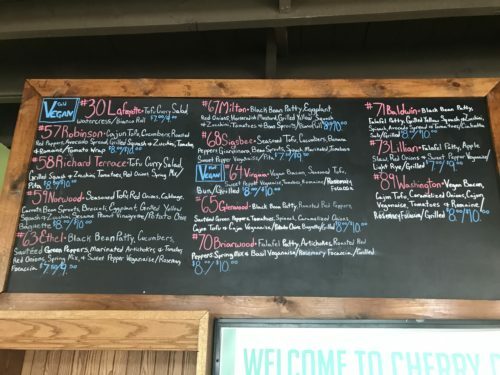 The chalkboards all over the walls serve as the menus. They are all in big enough writing that it shouldn’t be hard to miss the vegan sandwich section (there’s also a vegetarian section, and many of those items can be veganized very easily as well). Each sandwich is named after a street in the East Hills neighborhood. 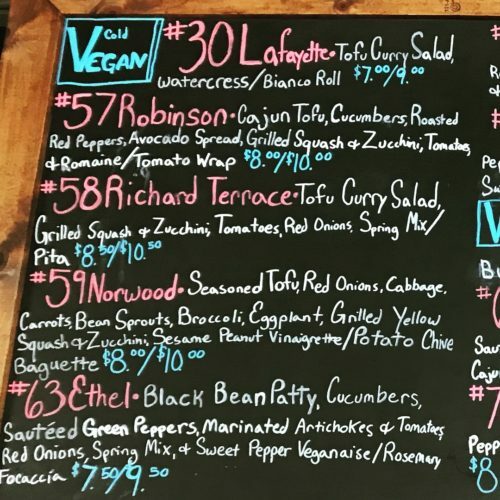 The vegan section of the menu has over 10 sandwiches to choose from, broken down by cold or grilled. Like we said, you’ll be overwhelmed by what to choose! One of our favorites for cold is the Ethel – black bean hummus and loads of veggies on sundried tomato focaccia. For hot, check out the Washington – vegan bacon, Cajun tofu, caramelized onions, Cajun veganaise, tomatoes, and romaine, grilled up on rosemary focaccia. There are also a handful of salads. Those are usually listed behind the counter up on a chalkboard. You should also see the soup of the day listed there – sometimes vegan, sometimes not. Seating is limited and during lunch, there can be a line if you don’t get there early enough. If you’re in a hurry, you’re better off to call ahead. They also deliver through Door Dash. You can order sandwiches in either a half or a whole. We’ve never been able to sort it out, as the half is as big as the whole but cheaper? 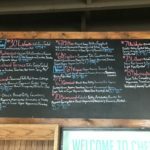 Either way, Cherry Deli is a solid spot for sandwiches.